RDC is on an urgent mission to find ice in Africa - why? No, we’re not mad, and we’re not looking for ice from the local Engen garage or the stuff that De Beers wants. So, what’s our mission about? We’ve watched the world embrace new tech, already working and living in their larney smart homes and businesses. Yet in Africa, the 4th Industrial Revolution is frozen with mainly corrupt politicians enjoying that type of stuff. Is it possible for Africa to leapfrog the global IoT gap? Imagine we could bring affordable tech to African households and businesses by way of the millions of alarm systems already installed. We’ve tried every hair-brained technique to find ideas, approaching problems back-to-front and exploring the past, present and future for inspiration. To be honest, we came up with nothing! But, maybe the solution for Africa is not in the 4th Industrial Revolution. Maybe our inspiration will come from one of the archaic ages. Finding stone age, bronze age or iron age inspiration is tricky, but it turns out there is still ancient ice in Africa. And, can you believe the locations are near the equator, and we even have glaciers? Now we have a new mission. 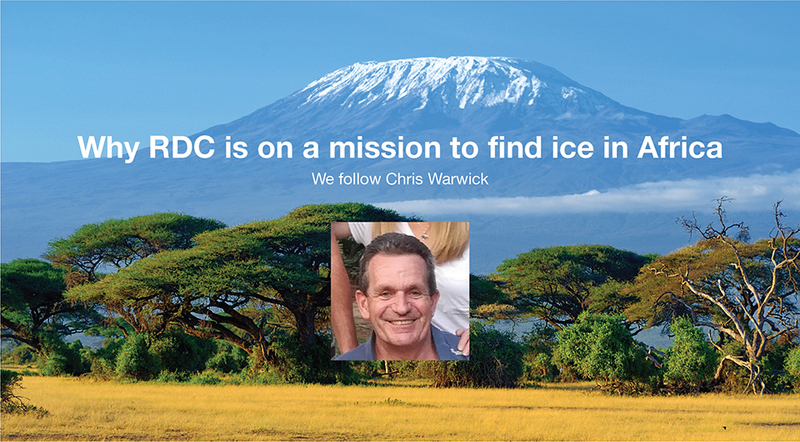 We decided to send engineering globe-trotter and endurance sport enthusiast, Chris Warwick, to find inspiration for us from the age-of-ice at the top of Kilimanjaro. We’ll be following him to share his discoveries, and we invite you to join him by following his African-Ice-Age blog during his short adventure.